WebhostOne GmbH Review 2019: Is WebhostOne GmbH a Good Hosting? WebhostOne GmbH offers German web hosting with a 99.9% uptime guarantee and SSD storage. Higher packages are generous with extra features, however, the entry-level packages are noticeably lacking in value. WebhostOne is a German host that has been providing hosting services since 1998. 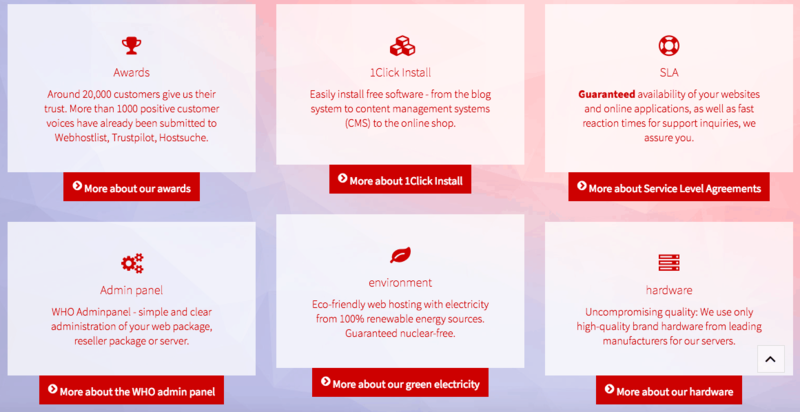 Its servers are collocated in a 100% green energy data center located in Karlsruhe, Germany. The company has more than 20,000 customers and 1,000 positive customer testimonials on independent review websites. The website is available in German. There are four shared hosting plans: Business Card, Single App, Multi App, and Power App. The vast majority of the value added features are not included in the smallest plan, Business card. So, if you’re looking for any kind of extra feature (other than disk space and bandwidth), it would be safe to assume you’ll need one of the higher three packages. All of the shared hosting plans (except for the smallest plan) come with a website building tool. This offers 20 subpages and 100 customizable themes to choose from. It’s not possible to demo the tool before purchasing, so I can’t comment on how easy it is to use, however, it does appear to be a simple point-and-click interface for beginners. There’s also a one-click installer to install a limited number of programs. If you are a developer, you can disregard the base package as it doesn’t include any features you need. There is support for PHP versions 5 and the twice as fast version 7, Perl, Ruby on Rails, and Python, however, these are not included in the base plan. There’s also FTP, SFTP, and SSH access, along with cron jobs light (to schedule scripts hourly, daily, weekly and monthly) and cron jobs professional (to schedule scripts according to your own schedule). As I’ve discovered, the base package does not include any of the features most users need (website building tool, support for PHP, or advanced coding languages), so while it’s very cheap, it’s a really not viable for most customers. The next package (Single App) comes with 25GB disk space, unlimited bandwidth, and all of the value added features detailed previously. It’s still a good price. However, here’s the catch. If you need more than one domain, you need to upgrade to one of the higher two packages, which are quite pricey. The contract length depends on which plan you choose: the cheaper plans require longer terms. Business Card is purchased in twelve month terms, Single App in six, Multi App in three, and Power App in one. There’s a setup fee on all plans, equivalent to approximately one month of service for said plan, plus there’s a seven day free trial. There is telephone support available Monday to Friday from 8:00 a.m. to 5:00 p.m., live chat is available Monday through Thursday from 8:00 a.m. to 9:00 p.m. and Fridays from 8:00 a.m. to 5:00 p.m. You can also send an email or submit a ticket at anytime. Be cautious, support by email is free but all other methods will incur a charge. As well as having really transparent business hours, the SLA outlines the expected response time. Technical issues from 8:00 a.m. to 10:00 p.m. (every day of the week) will receive a response in two hours and from 10:00 p.m. to 8:00 a.m., expect to wait up to twelve hours. All other inquiries can take up to 24 hours (or even 72 on weekends and holidays). Clearly, some of the response times are quite slow, however, I do like the fact it’s all laid out in advance. In my experience, the response time has been immediate when I contacted them during business hours on live chat. If you’re stuck waiting (unlike me), there’s an extensive FAQ section on the website to research your issue. WebhostOne GmbH is a good hosting provider offering a lot of value added features for beginners and experts, as well a 99.9% SLA and SSD storage. However, if you need anything more than disk space and bandwidth, expect to need to upgrade to one of the pricier plans, at a premium price point. Wondering how WebhostOne GmbH stacks up against other Web Hosting companies? Enter any other Web Hosting company and we will give you a side-by-side comparison.